In a world where content is king / queen and online research and learning is the most powerful and preferred way of finding information, digital storytelling tools have emerged. Why not enhance the access and engagement to your digital collections by sharing the stories about your community and collections? Online storytelling and community engagement initiatives within our Recollect Community has inspired our Recollect team to develop a series of new features that help our Recollect Administrators bring life to the stories within their digital collections. The often-hidden stories within collections and the relationships between items can now be easily documented and displayed in a Recollect site adding to the richness of the metadata and knowledge around a collection. The new storytelling features include a Narrative tool, Timeline tool, a Collections widget, and a User Map widget to identify the level of engagement with your stories. The new Narrative Item allows Recollect Administrators to create and display stories – or Narratives using their existing and additional digital collections within their Recollect site using a simple “blog-like” editing tool. Using the Narrative Item, Recollect Administrators can tell the stories between assets by linking data and collections together in a comprehensive way. Uncovering the stories connecting a digital collection and recording them for digital engagement with their site visitors and researchers. Each Narrative then becomes an “item” within the Recollect site that is easily searchable and discoverable and linked to the assets and metadata in the site. View a Recollect Narrative here. The Timeline Item is an interactive display tool for visitors to discover the history of a topic, event, person or any kind of metadata collection a Recollect site may hold. When telling a story that has a rich history that spans years of content, events, people and digital collections, the new Timeline Item allows Recollect Administrators to display a visual Timeline that shows the content in time relationships. View a Recollect Timeline here. The University of Newcastle site Living Histories have a great example of displaying their collection with the Timeline Item, see here. 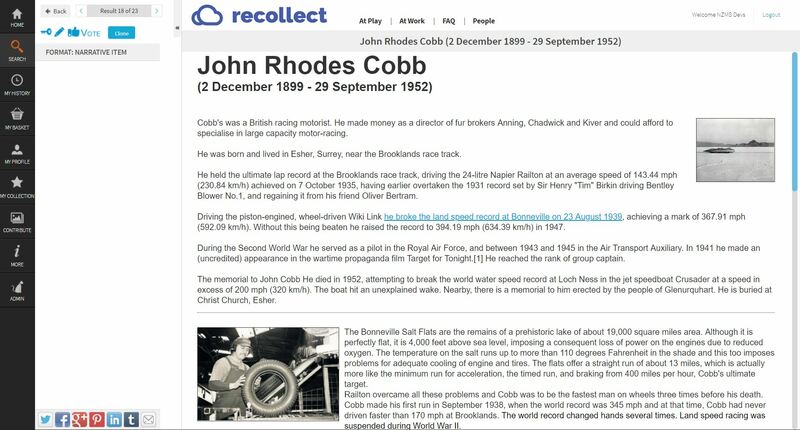 With incredible collections recorded and displayed in a Recollect site, our Recollect team have developed a new option to highlight collections on the homepage of a Recollect site. Bringing more awareness and promotion of collections, narratives and timelines to the eyes of site visitors. The Collections Widget allows Recollect Administrators to choose their best and most relevant collections to display on the homepage of their site. 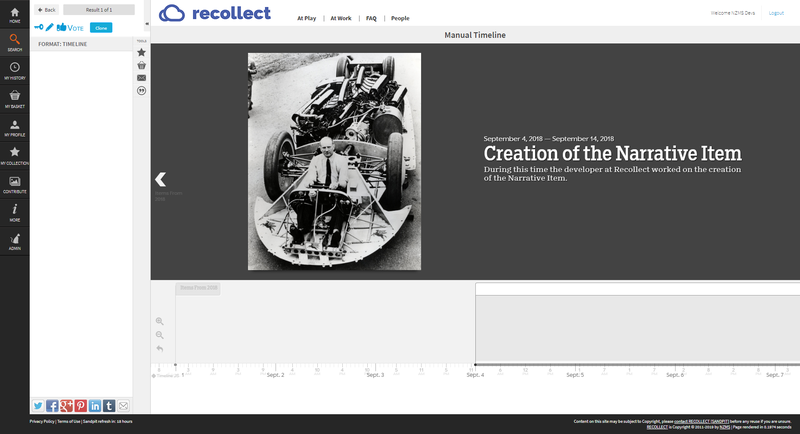 View the Recollect Collections Widget here. Having shared your stories using Recollects Community Engagement and Digital Storytelling tools, the User Map tool allows users to review and analyse the engagement in the content. 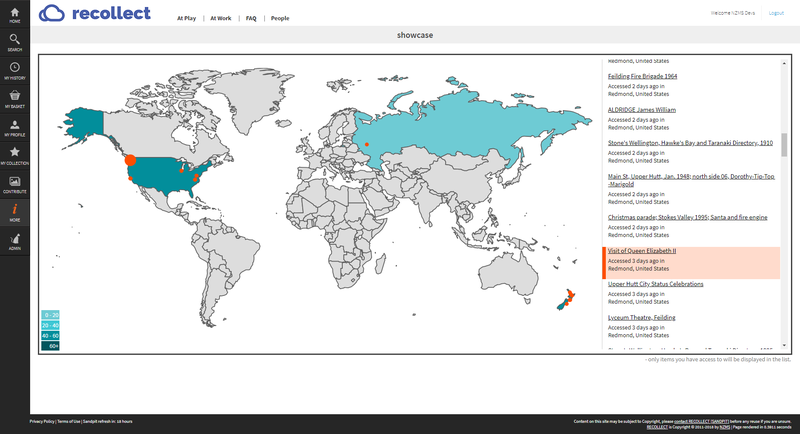 The new User Map widget allows users to view the geolocation of site visitors and what items they have viewed. Perhaps you have a collection that relates to a specific area of your community, using the User Map widget you can analyse the engagement through a simple world map display – showing the individual asset, narrative, timeline or collection that a user has viewed and engaged with. View an example of the User Map widget here.